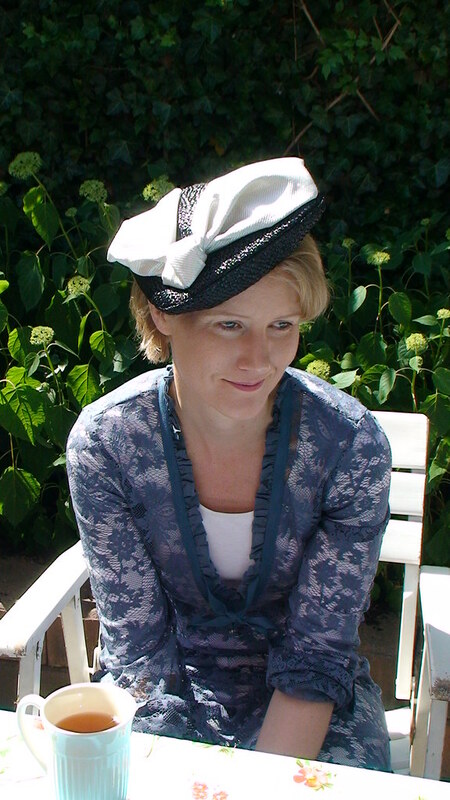 This is my sister in law, Mirjam, wearing (with great style) the second hat I’ve made based on Ruby Carnahan’s pattern “Felt Pattern Hat”. 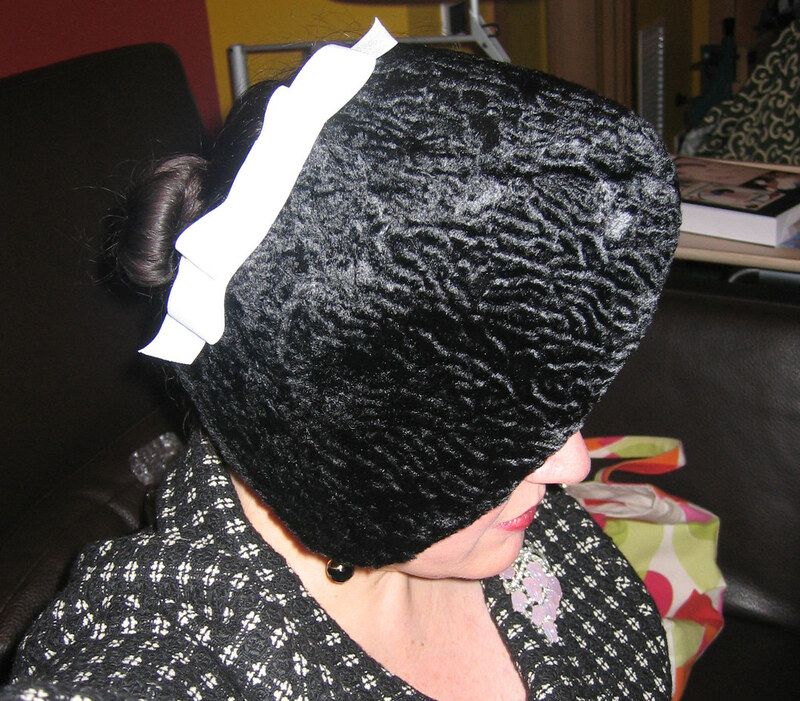 The other one I made was with faux astrakhan (persian lamb) and a white grosgrain ribbon, which is quite winterish, so it was time to make a summer version. I’ve made the new one using a woven raffia fabric (vintage, belonging to Nina), and I’ve trimmed it with a huge knotted bow made out of a spectacular Gratacos silvery shiny fabric. Gratacós is a fabulous fabric shop that first opened in the 1940’s, and that has been recently remodeled to sell also accessories (among which, hats). They are fabric designers and sell their own range of fabrics. Their shop is at the center of Barcelona (Passeig de Gracia 110) and well worth a visit. Back to the hat, I must say that working with the woven raffia has been a pain because it tends to fray, even though I first cut the pattern from (strong) iron-on interfacing, which I ironed into the rafia and then cut. I should have done a zig-zag on the edge, which I had to do later under difficult conditions. 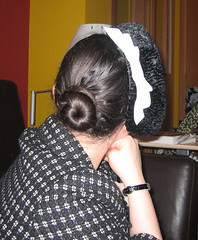 I plan on doing another version of this hat with a different fabric. If I get my new digital camera soon I will document the process! Felt Pattern Hat (with faux astrakhan instead) and new shoes! You might ask yourself why I’m calling this hat a Felt Pattern Hat when it’s not made out of felt but of faux astrakhan fur. 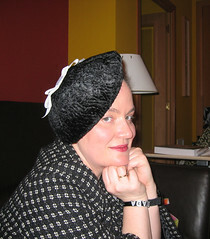 The reason is that the pattern comes from Ruby Carnahan’s book How to Make Hats (the 1952 edition with the red cover -hence not the same book from which the Hat for Ship and Shore pattern comes from, that’s the one with the yellow cover). 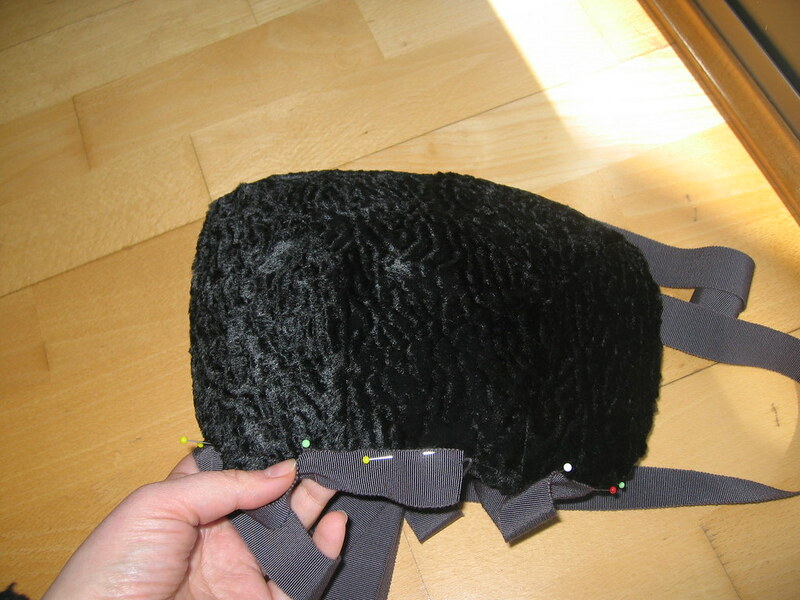 One is supposed to make this hat out of a felt hood cut open on one side and ironed flat, the pattern pieces being cut from that open felt. 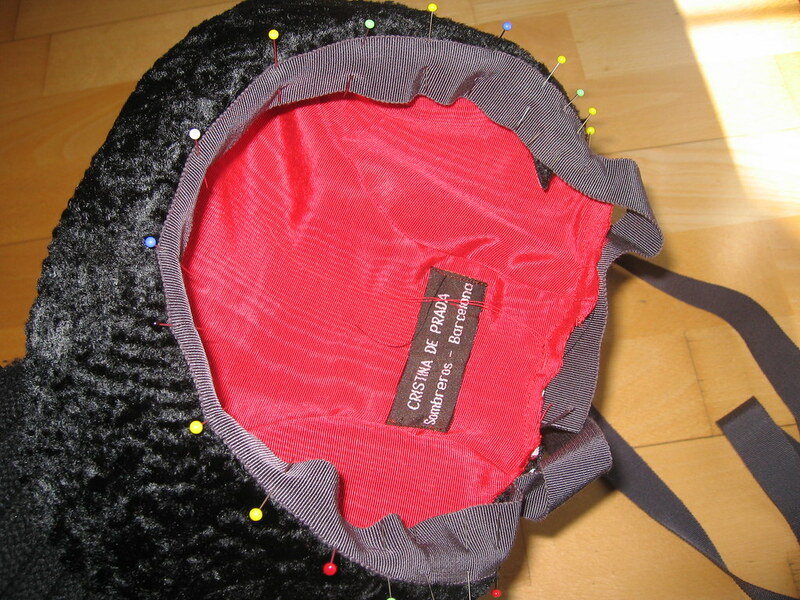 I was ready to sacrifice this felt hood (well that’s a cone not a hood…), when common sense or perhaps a lack of adventurous spirit made me give up the idea, and switch to the faux fur. The hat pattern is great, flat on the back where it stays close to the head and wonderfully three dimensional on the front. It kind of looks like a crab shell! You can find the pattern and explanations (which are scarce) on Vintage Sewing’s website, which by the way is a wonderful resource for many other books. I didn’t know how to finish the hat until these beautiful shoes crossed my path. My mom decided to get them for me as an advanced birthday present. 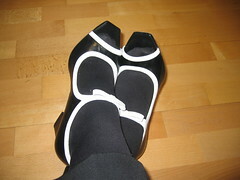 They are Muxart shoes, a well known cult brand from Barcelona. They are wonderfully retro, comfortable (although the ball of my feet hurts terribly when I stand up for a while but that is lack of practice) and they are just the right shoe to wear with a hat. When I got my new shoes I knew it would be fun to put a flat white grosgrain bow on the hat to match the shoes, and I actually had to do that in record time because that very afternoon I got the shoes I went with my friend Nina to a a presentation about fashion tendencies (regarding color, materials, textile and accessories) for winter 2009-2010. The presentation was done by fashion guru Angelo Uslenghi and was very interesting. It was my first time in one of these things and I want to say thanks to Helena who got us in (she belonged to the organizing team). 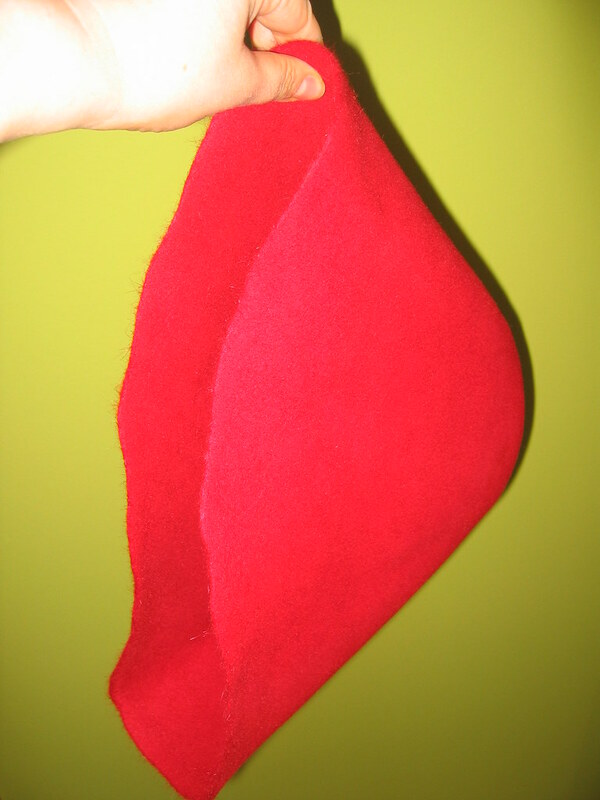 So I bought the grosgrain and rushed to make and sew the bow in place. I will have to re-do it because it didn’t come out 100% right, and perhaps I will completely change the way it’s laid out on the hat. If I do I will take pictures and show you! Anyone wants to try and make one of these?